The Battle of Trafalgar (21 October 1805) "was a naval engagement fought by the Royal Navy against the combined fleets of the French and Spanish Navies, during the War of the Third Coalition (August–December 1805) of the Napoleonic Wars (1803–1815)." HMS Victory "is a 104-gun first-rate ship of the line of the Royal Navy, ordered in 1758, laid down in 1759 and launched in 1765. She is best known as Lord Nelson's flagship at the Battle of Trafalgar in 1805." "England expects that every man will do his duty" "was a signal sent by Vice Admiral Horatio Nelson, 1st Viscount Nelson, from his flagship HMS Victory as the Battle of Trafalgar was about to commence on 21 October 1805..."
"Vice Admiral Horatio Nelson, 1st Viscount Nelson, 1st Duke of Bronté KB (29 September 1758 – 21 October 1805) was a British flag officer in the Royal Navy. 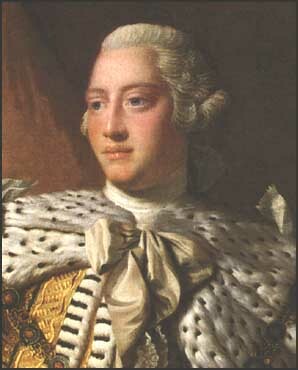 He was noted for his inspirational leadership, superb grasp of strategy, and unconventional tactics, all of which resulted in a number of decisive naval victories, particularly during the Napoleonic Wars. He was wounded several times in combat, losing one arm in the unsuccessful attempt to conquer Santa Cruz de Tenerife and the sight in one eye in Corsica. He was shot and killed during his final victory at the Battle of Trafalgar in 1805." Trafalgar Square "is a public square in the City of Westminster, Central London, built around the area formerly known as Charing Cross. Its name commemorates the Battle of Trafalgar, a British naval victory in the Napoleonic Wars with France and Spain that took place on 21 October 1805 off the coast of Cape Trafalgar, Spain." 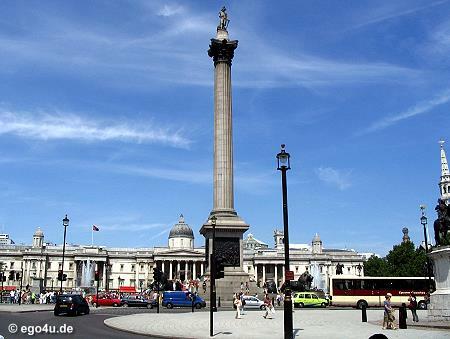 Nelson's Column "is a monument in Trafalgar Square in central London built to commemorate Admiral Horatio Nelson, who died at the Battle of Trafalgar in 1805. The monument was constructed between 1840 and 1843 to a design by William Railton at a cost of £47,000. It is a column of the Corinthian order built from Dartmoor granite. The Craigleith sandstone statue of Nelson is by E. H. Baily and the four bronze lions on the base, added in 1867, were designed by Sir Edwin Landseer...."